Pitcairn Island arise from the great Southern Ocean, as a rugged island of formidable cliffs of reddish brown and black volcanic rock. The twenty refugees aboard His Majesty's Armed Vessel "Bounty" set sail in search of a haven to escape from the long arm of the British Admiralty and undoubtedly the hangman's noose. Somewhere in the 70.000,000 square miles of scantily explored Pacific Ocean there had to be a refuge. HNAV "Bounty" criss-crossed the Pacific three times, visiting the Society Islands, Austral islands, Tonga, Fiji and the Cook Islands; a search totalling 7,800 miles. Various circumstances rendered all these islands unsuitable. In the first few days of 1790, Fletcher Christian arrived at the place where one of Bligh's charts indicated that Pitcairn's Island should be. He found nothing other than boundless stretches of ocean. This was to be their salvation, as the island had been incorrectly charted by Carteret in 1767. The island was as good as undiscovered. If the mutineers could sight the island, they would find precious oblivion. Working "Bounty" for 200 nautical miles west along the line of latitude, Pitcairn's Isle finally came into view on 15 January 1790. Their joy and exhileration was soon quashed. After an agonising 48 hours, it was feared that a landing might be impossible. 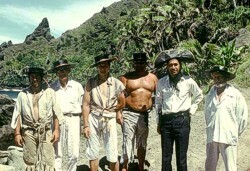 Finally, on the western coast, three of the Polynesian men were able to set Christian, Brown, Williams and McCoy ashore. Two days of exploration revealed an island with a great plateau pierced by ravines 200 feet in depth, crowned by ridges 500 feet high and a peak which soared to almost 1,000 feet. The valleys were a lush tangle of tropical vegetation, laced with ferns, vines and fragrant blossoming frangipani and tefano, so beloved by Tahitian women. Life supporting coconut palms, breadfruit and pandanus grew in abundance: an instant source of food. The shoreline, though rugged, abounded with fish, shell fish and crayfish. Fresh water was plentiful. It was truly a paradise which was to become home for the next two hundred years. On 23 January 1790, the die was truly cast. One of the crew, possible Quintal, set fire to HMAV "Bounty", thus sealing their fate forever. On the days leading up to this, everything portable was removed from the vessel; sails for temporary tent houses, oak for permanent dwellings. Goats, pigs and poultry swam ashore. It is said that an infant girl, Sully, then a little over a year old, was transported ashore in a barrel. From the landing place, the salvaged goods were back-packed or hauled up the formidable slope, known to this day as "Hill of Difficulty". Many tales have been written over the past 200 years concerning the mutiny and it's aftermath. Hollywood has created three distorted versions of the event. Only Pitcairn herself knows the true story of events in the tragic years which followed. Did Fletcher Christian in fact escape to set his feet on the green shores of England once more, or did he perish along with the other mutineers, when dissension occurred, or did he, in remorse and loneliness, cast himself from the cliffs to the rocks below? The peace and paradise, was shattered by man's greed, when the mutineers and their Polynesian comrades fought amongst themselves for supremacy, particularly over their women. From this dark period, the former able seaman, John Adams, the surviving mutineer, led his flock of ten Polynesian women and twenty three children, the Bible, salvaged from the "Bounty" brought peace and tranquility once more to this Utopia. 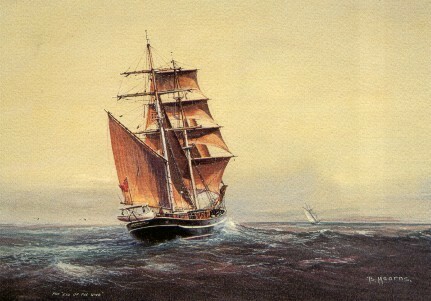 The sealing vessel "Topaz", after departing Hobart Town, where she had discharged her cargo of rum and gin, much to Bligh's disgust, sailed across the pacific and chanced to sight Pitcairn's island. Captain Folger of the "Topaz" was astonished to see a boat from the island paddling towards him. 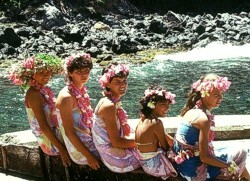 It was a Tahitian style canoe, manned by three young men as dark as natives and almost naked. To Folger's astonishment, the men called out to him in English. Captain Folger's findings, together with a copy of his log, arrived at the Admiralty in London in 1809. Britain was pre-occupied with the activities of Napoleon. Six years passed before HMAS "Briton" and "Tagus" reached Bounty Bay. By the time you receive this newsletter, "Eye of the Wind" will have slipped her mooring lines and departed Auckland for the 3,300 mile passage to Pitcairn Island. We are priveleged to have been invited by our friends to share in their celebration. Our now familiar South Pacific cruise schedule underwent a drastic change this year when only three days prior to departure from Sydney in May, we received a letter from the Solomon Island Government in answer to our previous correspondence. In order that "Eye of the Wind" might operate within Solomon Island waters, it would be necessary to obtain a Foreign Investment Licence, which would cost some $40,000-00. 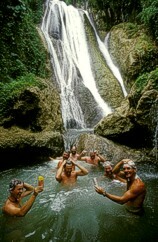 It was with a great deal of sadness that we decided to by-pass our old haunts and many friends in the Solomon Islands. Leaving Santo, we had an excellent trade wind passage across the Coral Sea where we cleared into Papua New Guinea at the gold mining island of Misims. PNG has always proved to be a wonderful cruise destination, with outstanding diving, very friendly people (despite what we are led to believe by the media) and as always we were laden down with carvings and artifacts. Ann Fielding with her group from Hawaii and Adelaide Skin Diving Centre joined us to share these adventures. Undoubtedly, the highlight was when the inflatable boats were able to approach a female humpback whale and her calf. Divers were actually able to touch the mammals underwater. The whales themselves seemed to enjoy this contact. Peter Kane rejoined the ship at Cairns, allowing Bill Walker a well earned holiday, and sailed with us to Sydney. We were able to assist Liz and Jonathon Hickling by ferrying stores and supplies to Middle Percy Island, where tey are planning to spend a year with the famous Andy Martin. It will be interesting to see, when we visit next year, whether Jonothan's home brew will take over from Andy's home made honey mead. Fair winds carried us on an excellent passage along the eastern seaboard, even allowing us to sail to and from anchor at Port Stephens. Whilst at anchor in Broken Bay, we were unexpectedly joined by "Anna Kristina" which we had thought was cruising in Vanuatu. Nice to see Mitch Macuipa as her Captain. Our annual survey was undertaken at Wollongong, where the task of cleaning and painting the hull was made all the more easy with the added assistance from friends and trainees. On 5 November 1989 the inaugural Tall Ship's Regatta was held on Sydney Harbour. This event was well organised by Bryce Bathe and others. It was most unfortunate that Bryce missed the whole event, as he was stranded at Eden. There were nine square rigged vessels with sail set at the starting line: Anna Kristina, Bounty, Flying Cloud, Soiway Lass, Svanen, Søren Larsen, Tradewind, Young Endeavour and of course Eye of the Wind. Nor'easterlies gave the vessels a run from Manly across to Nielson Park and Clark Island. Conditions were such that Tradewind and Young Endeavour battled for the lead, followed by Solway Lass and Eye of the Wind vying for third and fourth place. Our able tactician and pilot, John Biffin, was able to carry Eye of the Wind to third place. A superb scrimshandered sperm whale tooth was presented to Tradewind who carried line honours on the day. This trophy, which is to become perpetual, was carved by Jesper Rasmussen from Albany, who came to Sydney for the event. Liz and Phil Castleton are the proud parents of a son Thomas, born on 8 November 1989, just a little late for the regatta. Wayne Chimenti is to rejoin us in Auckland for the first voyage to Pitcairn. He is the proud father of a daughter, Nadja Pacifica. Helen Bird is off to Antarctica in the schooner "Sol" with a climbing expedition for National Geographic. Ray Commins is now decked out in whites as Mate aboard a motor vessel in the Mediterranean. Suzy and Roscoe will be operating Peter Malcolm's pearling lugger "Redbill" for Greenpeace Clean.Seas project. Richard Grono is completing Maritime History studies in Fremantle, whilst at the same time continues to teach many ex "Leewin" trainees at the Maritime College. Past crew members spanning many years will be joining in Auckland for the Pitcairn voyages and beyond. They include Anne Wotton and Bruce Phillips from Operation Drake days, also Carol Wilby, Dan Parrott and Andreas Kroll. Kevin Deacon's book "Australia and the South Pacific" exploring the underwater world has recently been released. 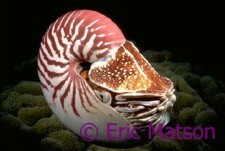 His photographs of the ship and dive locations in the Solomon Islands are up to his usual high standard. Unfortunately the New Zealand Government has decided against financially supporting the privately organised Tall Ship's Race from Hobart to Lyttleton in November 1990. As a result of this we have been forced to re-organise our sailing schedule for the latter part of next year. Details are enclosed. This means that we will not be in Hobart Town until early 1991. There are still a number of very fine art prints of Bill Mearns magnificent painting available from the office at $35-00 each. P & P $5-00. Also available, linen finish cards of the same painting, with envelope at $2-00 each. Suitable for all types of greetings. 1990 is shaping up to be a great year with lots of bookings already. If you are thinking of joining us for another voyage, book early, don't be disappointed. As the Second Mate rings the bell, it is time for us to hurry on deck to stand watch. We would like to wish you all a very Merry Christmas and a Happy New Year.